How much time we got?? Seriously, i'm horrified how many I actually have... Apart from minor things like hair on the soap, empty plates in the fridge, slices of bread/toast that aren't buttered to the edges, cups served with tea/coffee slopped in the saucers. Don't use saucers; I'm more likely to give you a mug. I do have very pretty cups & saucers but rarely use them. Messy bathrooms with lots of 'stuff' everywhere. Jars & butter containers with it all over the sides. I always scrape it back down together – this stops it from drying out or going rancid too. I never put them in dishes as i butter bread & put on the topping in the kitchen. I guess I hate 'mess' – not that you could tell from my sitting room! It might look a mess, it's more that it's crowded but I know where everything is. Thoughtless people, who's only thought is what they want, as though the world revolves around them and owes them a living. It makes them rude, demanding and boorish. Anyway, i went up and got the papers & bread and because Lakeland is open on Sundays [i had an order waiting to be picked up], i went on into town to get it. Nice day, not too much of a wrench, even though i really didn't bank on going out today. i decided to have a look at the Sunday Market while i was there. i don't remember doing a Sunday one. It was heavy on the craft & tourist stalls and specialty food. There's a couple of bakeries, a nice wet fish stall and more of the organic fruit & veg. i bought some vintage tomatoes [they look and smell terrific], a couple of croissants for lunch and some little presents for friends - just as well i ran out of cash by then! Very few of the traders have card facilities, perhaps it's as well! The tomatoes do have thick skins and i'll have to remember to skin them before use in future, but they are nice. 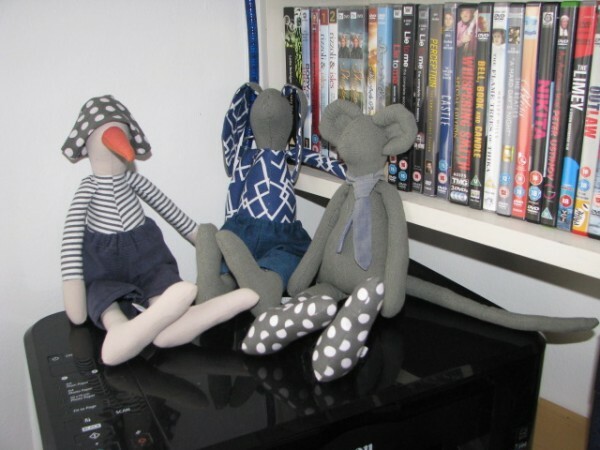 i've included a photo of my three Timor hand-made dolls, also on the right of me, sitting on my printer - too good for any child! I like the look of those tomatoes! I imagine they are delicious grilled which would soften up the skin. i must try that and see. You can only buy these tomatoes in markets, they're not readily available unfortunately. You can buy small plants and seeds to grow in season from specialists online. 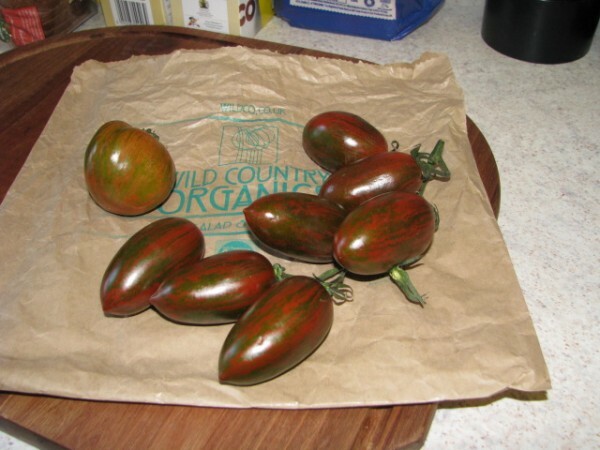 Look for Heritage or Vintage tomatoes, if you're interested, as they are very nice. I love those dolls. They are just too cute! !